Originally from the United Kingdom, Micheal has travelled widely over the country, inspired by its light and colour, and this has influenced his paintings. Micheal is currently living in his 1919 Classic Gentlemans Cruiser made from kauri, specifically to sail around the north island and paint the seascapes and landscapes from these gorgeous waters. His huge works can be viewed from Friday the 1st of February till the 1st of March. 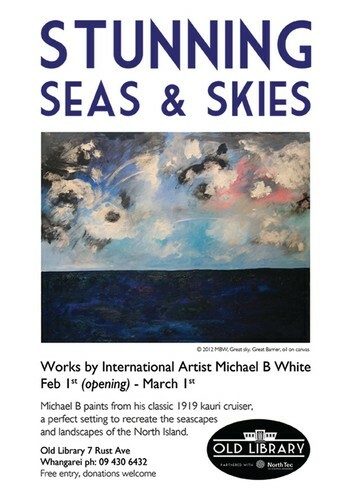 Opening event/meet the artist Friday the 1st February at 5pm.